Good morning, Stampin' Peeps! In our house we are down to the last week before school starts. Haircuts have been had, new shoes and sensory socks have been purchased, and this month's Stamp of the Month has finally been opened and used. I never meant for that last one to take so long, as this cat set is so cute, but that's how summer rolls to an end in our house. Since it's not feeling quite like summer anymore, I grabbed a packet of (retired) Sarita papers to make my first kitty cat card. I started with the new sketch from Retro Sketches. I cut my base out of Pomegranate cardstock, and layered on some patterned paper before adding a doily that I spritzed with Heidi Swapp Color Shine in Mustard. 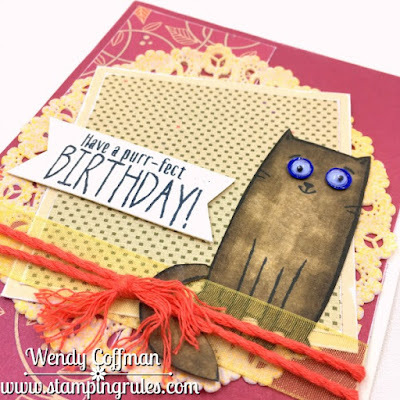 Then I layered on the dot print and popped up the sentiment with foam tape. 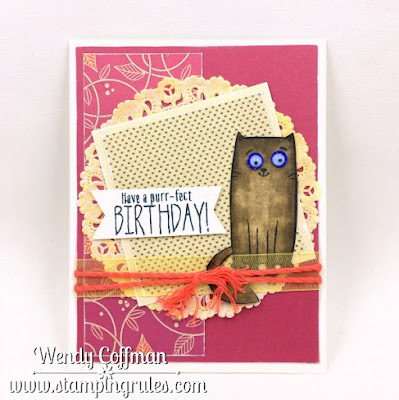 The sentiment is a combo of stamps from the SOTM and Sweet Birthday. I glued a strip of yellow organza ribbon down as a base for my thick twine wrap, which I shredded at the ends. I've seen so many adorable cards with this cat all dressed up, but I wanted to start simply, so I just colored him using a few Shin Han Markers and a lot of blending pen. I popped on a couple sequins over the eyes, then filled those with my favorite tiny wiggly eyes. Then I tucked him in amid the ribbons, right where a cat would like to be, purrfectly content!